I’m currently drafting a chapter for a collection edited by Lucy Noakes, Rohan McWilliam and Andrew Wood on New Directions in Social and Cultural History. My chapter is focusing on developments in animal-human history and I have been looking at the value of scientific thinking to historical writing. For example in discussing emotional relationships between certain animals and humans scientists have recently found that there is a ‘self perpetuating oxytocin-mediated positive loop in human-dog relationships that is similar to that of human mother-infant relations.’ The hormone thus helps deepen the inter-species bond. But scientific thinking is generally empiricist in its approach and ignores the value of historical context. 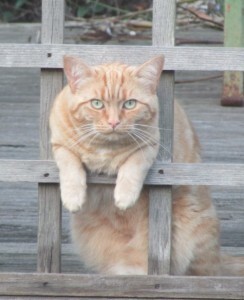 An example of the value of historical thinking might be found by observing Tommy posing in the fence, a common occurence. Tommy, like his brother, is a moggie with traces of various breeds in his genetic make-up. But his somewhat laid back ‘floppiness’ is not only due to his individual temperament but to traces of Ragdoll – a breed that did not come to Britain until 1981. His appearance and preferred method of sleeping with his legs in the air is neither ‘natural’ nor timeless but situated in a historical time, after specific human intervention. That he feels sufficiently relaxed to be sitting in the garden sun rather than hiding (for fear of human attack) or desperately looking for mice or birds to eat (rather than awaiting the inevitable Sheba with Dreamies treats) is also of a particular social context. I am well aware that philosophers such as Montaigne and Derrida have used their cats to think with but this is surely also open to historians.